Today, the Plaxico Burress case was adjured until the later date of June 15th. Many people were skeptical weither this would happen or not, but it may be a sign that his high priced legal team may be close to a plea deal that will allow him to play in the upcoming NFL season. 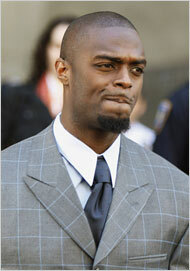 Regardless it seems as if Plaxico will have to do some sort of jail time, but the question is when. As I recall Jamal Lewis spent his off-seasons in jail, a couple of years back due to drug trafficking charges, and maybe it’s possible we could see something similar for the Giants superstar Wide-out. There is no question that Plaxico does not want to spend any time in jail. Yet, it seems more and more evident that it will be tough for Plax to stay out of the big house. New York city guns laws are a bit overboard and are seemingly unconstitutional, so this will be a very interesting case, without a doubt, if it ever makes it to trial. The Sportsroids.com team will be supporting Plaxico on June 15th at New York city Criminal Court by picketing the trial! So if you wish to support the Giants Superbowl champion wide out, from the moronic liberal city government that wishes to jail him mostly due to his celebrity, please show up! Plaxico, hurt no one except himself and he is now being denied basic liberties that Thomas Jefferson, one of our founding fathers, fervently believed in. Jefferson stated his strong convictions in the right to bear arms consitently. One example of this fact is on Page 334 of his famous Thomas Jefferson Papers when he wrote, “No free man shall ever be debarred the use of arms. The strongest reason for the people to retain the right to keep and bear arms is, as a last resort, to protect themselves against tyranny in government”. Realize that no citizen in New York City can apply for a conceal permit, and to get a carry lisence is a very tough process, in hopes that people won’t try to get one. Sounds a bit unfair doens’t it? Regardless, I feel that the the cities gun laws are ridiculous, for this reason. Banning weapons and making them harder to aquire legally only strengthens those who don’t follow the rules, much like the steriods ban in sports. Those who cheat are winning, in the system. These laws only serve to help criminals stay finaiced and in power over the law abiding populous of New York City. RIGHT ON!! could’nt have been said better., . As for Plax ! ?—come on, it was an accident, let it slide, a few hours community service. Haha The recent release from the giants puts a whole new spin on my story, but i really do believe he will have the opperunity to play next season, now the question becomes where ? and also after how much time in Jail?